Red Nose is a recently established hostel, situated on a quiet and narrow cobbled backstreet of Old Town. Absolutely enchanting place, extremely warm and friendly staff, free tea&&coffee, comfortable rooms&&beds, perfect location inside the old city. No common room yet, but I think they are planning to get one. Nice friendly helpful staff. Warm. Superb location. Nice artwork. Comfortable beds. This is a pretty new hostel, clean sheet, super clean bathroom, not several individuals yet! Great little hostel in a best old town location. 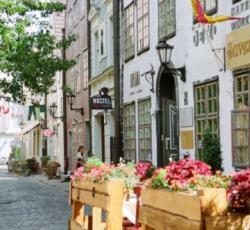 Staff were friendly and helpful and exceptional at recommending points to do in Riga. Beds were clean and comfy. Bath rooms on each floor were spacious with great showers. Lockers for crucial documents. The kitchen was a little pokey an only had basic cutlery, microwave, toaster, kettle and fridge. Amazing location inside the old town, within walking distance of the train station, bus station and central market. Really beautiful staff at the front desk. The location is great, it is really clean with no cost coffee and tea. Micro wave and fridge avail. Extremely light and airy. * Red Nose Hostel rated 4.5 out of 5 based on 10 customer reviews. Hostel reviews with a star rating are sourced from HostelBookers. If you find Red Nose Hostel with the same booking conditions at a lower rate somewhere else on the internet after you have booked, we will refund you the total difference.